In the 1985 film, Kush Groove was a song by Force MD’s called Tender Love. It was also featured on the American R&B vocal group’s second album, Chillin. In the spring of 1986, Tender Love peaked at #10 on the Hot 100. It was their only single to crack the Top 20. On the Adult Contemporary chart, Tender Love peaked at #2. Internationally a hit in the UK, Tender Love reached #23. Force MD’s formed in Staten Island, New York in 1981. They became pioneers for the new jack swing music movement of the late 80s/early 90s. The MD stands for “Musical Diversity.” Force MD’s were six members deep: Stevie D., Antoine “T.C.D.” Lundy, Rodney “Khalil” Lundy, Jessie Lee Daniels, “Trisco” Pearsen and Charles “Mercury” Nelson. Sadly Nelson suffered a fatal heart attack in 1995 and Antoine Lundy died from Lou Gehrig’s disease in 1998. Force MD’s have continued on with some new members, releasing their sixth album, The Reunion in 2000. They haven’t had much chart success since Tender Love. his Army career entertaining the troops. When he returned home, he earned his bachelor’s degree from West Virginia University in 1948 and began his entertainment career. His first national appearance was in 1953 (to 1955) on the soap Search for Tomorrow. He went on to The Steve Allen Show amd The Red Skelton Show. In 1958, Knotts broke into film in No Time for Sergeants, reprising his Broadway role from a year earlier, where he met Andy Griffith. In 1960, Griffith got his own show. Pal Knotts played Deputy Barney Fife and won 5 Emmys. Knotts left Andy Griffith full-time in 1965, though he reprised his role several times until the series ended in 1968. The reason why he left early was Griffith wanted to end the series after five seasons. Believing him, Knotts looked for other work. Griffith then changed his mind, but Knotts had already signed a contract with Universal Studios. Knotts continued making movies and TV appearances before landing back on series television in 1979 on a little show called Three’s Company as landlord Ralph Furley. Even though Three’s Company was an established hit, the cast was terrified of Knotts because of his star status. Three’s Company ended in 1984. Knotts continued on in movies and on TV. His last substantial role was in Matlock from 1987-1995 as neighbor Les Calhoun. (Andy Griffith appeared at the same time on the series.) All told, Knotts was in 32 films, and over 50 TV series/specials/TV cameos. On February 24, 2006, Knotts died in a Los Angeles hospital from pulmonary and respiratory complications to pneumonia related to lung cancer. He was survived by his two children and third wife. Knotts was 82 years old. In Morgantown, West Virginia, on Don Knotts Boulevard is a memorial park containing his statue. Smile is an autobiographical graphic novel written by Raina Telgemeier. It recounts Telgemeier’s preteen years from grade six to entering high school. Smile is based on her web comic of the same name. After a Girl Scout meeting, Raina trips and falls, injuring her two front teeth. What follows is a long and frustrating journey, nearly a five-year experience with orthodontics and dental surgeries. If all that isn’t enough to deal with, throw in puberty, peer relationships and bullying too! Smile has won multiple literary awards including the Dorothy Canfield Fisher Children’s Book Award (2012). Big Stufs were individually packaged Oreos that were much larger versions of the original Oreo cookies. One Big Stuf Oreo was 250 calories! Big Stufs were discontinued in 1991.
appear on his 1960s satirical TV series The Frost Report. In 1970 the Ronnies were at an awards show and were entertaining the audience during a technical glitch. In the audience, BBC TV executives Bill Cotton and Paul Fox. Impressed, they gave the Ronnies their own BBC series which became one of the most successful and longest running light entertainment show in British TV history! The Two Ronnies was a comedy sketch series. The show always opened and closed at the news desk where the Ronnies would read spoof stories. Another popular segment were the Musical Finales in which the Ronnies would perform (sometimes in drag) and the musical guest would be a popular musician from the time, including Phil Collins, Elton John, the Manhattan Transfer, etc. 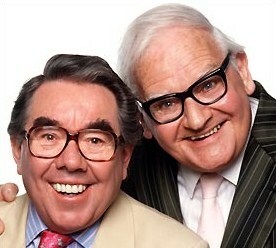 The Two Ronnies aired for 12 seasons or 93 episodes. After Christmas 1987, Barker decided to retire from show business and the series ended. American country singer Aaron Tippin wrote Where the Stars and Stripes And the Eagle Fly with Kenny Beard and Casey Beathard for his seventh album, People Like Us (2000). It didn’t make the cut. On September 11, 2001, the world was stunned by the events at the World Trade Center in New York City, the Pentagon in Washington and a field in Shanksville, Pennsylvania. Tippin remembered his patriotic single, Where the Stars and Stripes and the Eagle Fly. He recorded it September 13, releasing it September 17. It reached #2 on the Country chart and #20 on the Hot 100. All proceeds from the single went to relief efforts for the Red Cross and to the families of those affected by the September 11 terrorist attacks. The single raised $250,000. The video was filmed in New York City and includes rubble from the World Trade Center towers. Tippin has been a fixture on the country charts since his 1990 debut. Where the Stars and Stripes and the Eagle Fly was his only Top 20 Hot 100 appearance. His closest outing prior was in 2000 with Kiss This which peaked at #42. He has not charted on the Hot 100 since. In 1994, tough guy Arnold Schwarzenegger found out what it’s like to be pregnant in this American comedy film directed by Ivan Reitman. Schwarzenegger was geneticist Dr. Alex Hesse. Danny DeVito starred as ob/gyn Dr. Larry Arbogast who invented a fertility drug that reduced the chances of rejecting embryoes and would prevent miscarriages. Since the FDA hadn’t approved the drug, they weren’t able to test it on women so Hesse impregnated himself. Emma Thompson stars as geneticist Dr. Diana Reddin and Frank Langella as head of the review board Noah Banes. In the Groove was American soul singer Marvin Gaye’s 8th studio album. His last solo album had been 1966’s Moods of Marvin Gaye. Since, he had released a duet album with Kim Weston, Take Two and a duet album with Tammi Terrell, United. Gaye was having a pretty good career to this point; his biggest hit was arguably How Sweet It Is (To Be Loved By You) in 1964. The duet albums began to elevate his profile immensely. It Takes Two, Ain’t No Mountain High Enough, Your Precious Love, You’re All I Need to Get By, Ain’t Nothing Like the Real Thing and If This World Were Mine added to his hits. It was In the Groove which would pave the way for Gaye’s dominance of soul in the 1970s. When Motown boss Berry Gordy first heard I Heard it Through the Grapevine he turned it down, feeling the song “wasn’t a hit.” Berry eventually agreed to put Grapevine on the album but insisted other songs be released. But radio deejays began playing Grapevine. In October 1968, Gordy (who essentially almost had no choice but to) released Grapevine as a single and it blew up. It went to the top of the Hot 100 and the Hot-Selling Soul Singles chart. In 1969, Grapevine hit number one in the UK. Grapevine was Gaye’s first international hit. Motown re-released the album, this time named I Heard it Through the Grapevine!. This “working” submarine required 4 “D” batteries and was a very long 36″ in length. The grey and blue plastic submarines sat on wheels and would propel forward when turned on. 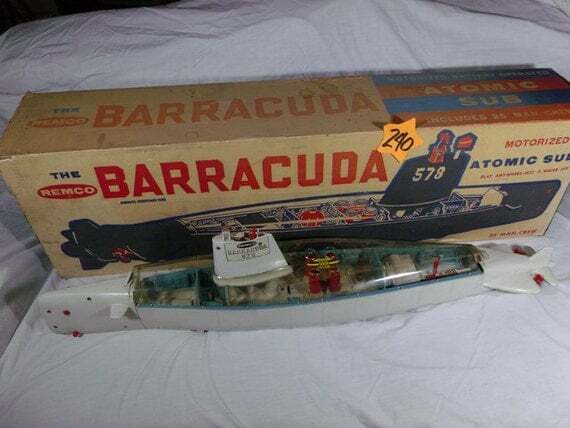 It had red torpedoes and missiles. It came with a clear plastic dome, a blue life raft and 20 crewman. In the late 1960s, black light fluorescent bulbs made everything white glow a little bit brighter. Black lights were also used to communicate in secret; black light is able to reveal secret symbols written on paper. In nightclubs, when black light was coupled with strobe lighting, an eerie purple haze was created. Black light is also known as UVA light or just ultraviolet light. The light emits long wave ultraviolet light and not much visible light. Lamps contain violet filler material that blocks visible light and allows the ultraviolet light through, giving the lamp a violet or blue glow when in operation. Bug zappers use black lights. Black lights are used in medicine, science and in forensics. These black lights are called Wood’s Lamps. You can use black light to detect counterfeit money. Tanning beds use strong UVA sources. Low level UVA emissions are not harmful to the skin or eyes, but the strong sources (like in tanning beds) are harmful and require protection.